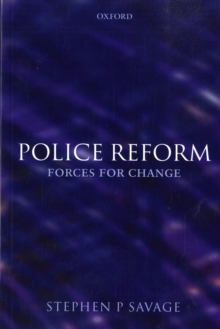 This book focuses on the very topical subject of police reform in the UK. Currently, the police service is undergoing a time of significant change and reform as a result of the 'modernisation' agenda. Planned force re-structuring, the performance culture, recruitment and training issues are just a few elements of this extensive reform process. There is therefore a need for a text which looks at this current agenda for reform against its historical backdrop anddebates the long term future of this process. The book spans three decades and is structured thematically around the main driving forces for reform, looking at the policy process and its related contexts. Key topics covered include system failure (when things go wrong), public order policing, internationalinfluences, economic issues and value for money, internal influences and political issues. The book adresses a complex and ever-shifting subject in an accessible manner.